Your part is scanned to produce point cloud data. 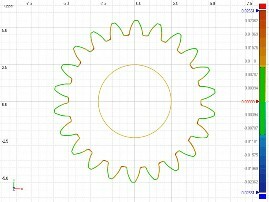 That data is converted to a clean mesh file that is then placed on top of the original CAD data. Rapidform XOV performs a best fit function by determining the most logical way to line up the data. This function is performed 20 times to ensure that the data is lined up perfectly. Now the scan data can be compared to the original CAD data to determine the differences. 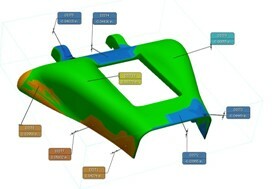 Color deviation maps will show where the part surface is above or below the design surface. Many other dimensional operations can be performed. Save time and money on first article inspections. Compare our timing and price to traditional inspection techniques. 100% inspection vs. "measure what you can". Every point on every surface is measured, not just selected points. Eliminate unnecessary future inspections on areas that are well within tolerance. Less time collecting data means more time left to analyze. Shorten approval times and ship your product sooner. Web-based collaboration with interactive 3D models. Boundary, sillhouette curve, virtual edge and reference geometry deviation color mapping.